Perfect for kitchen, bedroom, living room and dining room. 1. Cover your windows and enhance natural light filtering with AliFish sheer curtain panels. They gives an elegant look suitable for your modern dwelling. Each panel is easy to remove for cleaning and maintenance and won't wrinkle when hanging in front of your windows either. 2.These curtains are ideal window treatments for living room . Not only do they provide privacy, they also allow the sun's soft light to gently stream into a room. The panels are offered in different lengths, thereby ensuring a custom fit for covering a window or door. 4. Our products' pictures are real and shot by professionals. However, due to differences in computer monitors display, there can be color variations between the actual product and your screen. Tips: A good gift sent to your mum, friends and colleagues. A new collection for a new idea protects your privacy and bloom your new taste. Please allow 1-5cm discrepency as the sheer curtain is a manual production. ROD POCKET PROCESS, suitable for most common rods. Please allow 0.4-4.0 inch admissible error because it is totally handmade. It is better for your curtain's width to be 1.5-2 times of your window's width. Care Instruction: Machine Washable. Hand Washable, too. Low iron. 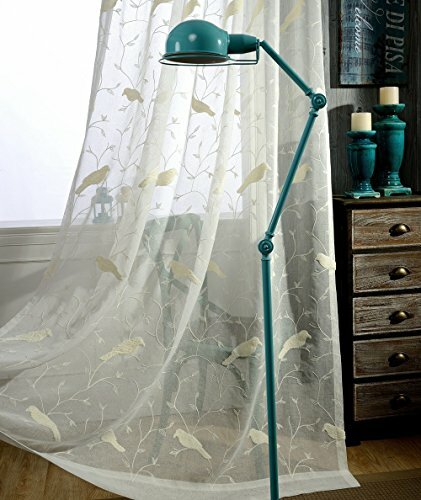 Our AiFish birds embroidery sheer curtains has provided you a very free and relax feel at home even though you shoulder heavy responsibility during your work, just like you walk in forest listening birds singing. Our pure white sheer curtains make your room look innocent and relaxed. What a wonderful scene! If this curtains hang up your children' room, they will read books in natural atmosphere or sleep in a quiet mood. It is suitable for children room and living room specially. If you have any questions about this product by AliFish, contact us by completing and submitting the form below. If you are looking for a specif part number, please include it with your message.